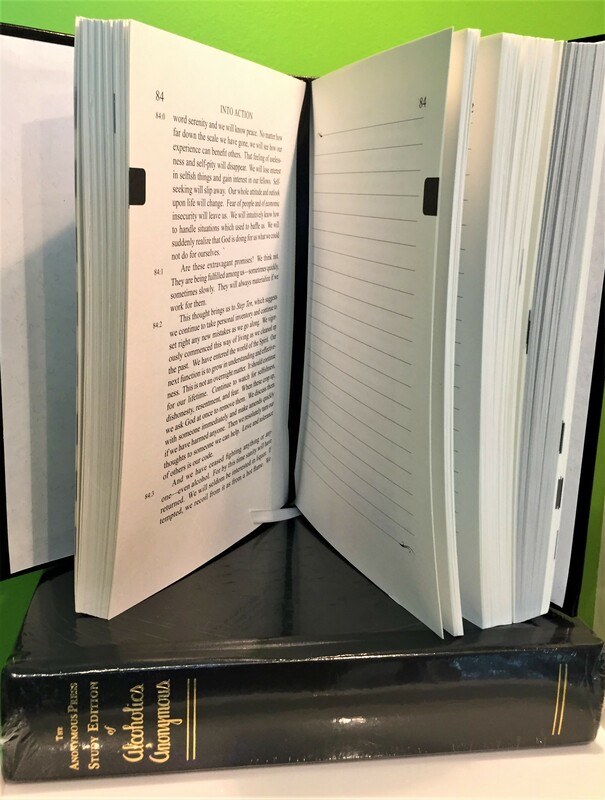 The First 164 pages of The AA Big Book Study Edition comes with lined pages opposite of the text for note taking. This AA Big Book Study Edition includes the original Foreword, The Doctor's Opinion and Dr. Bob's Story. Entire Original Manuscript (about) including the stories. Easy to read retyped version. Includes paragraph numbers corresponding to the modern text for easy comparison. This AA Big Book Study Edition includes two place keeping ribbons. Special "lay flat" binding. Available in black leather. About the 4th Edition: All the indexes we publish are for the 1st 164 pages (the main text). The text and page numbers are the same in both the 3rd edition and 4th edition of The Big Book. You can use any of our indexes with either edition. Dictionary- Definitions to the obscure and keywords taken from dictionaries in use at the time the book was written. Mostly from the 1937 Unabridged Webster's Dictionary. 276 entries.